People are always nice about headwear - there's something about a good hat that just makes them smile. So I couldn't resist naming this post after the three words I nearly always hear when I'm wearing headwear from one particular company: Suburban Turban. In the interests of full disclosure, I should say I'm fortunate enough to now know their supremely talented head honcho Nicky, who's become a dear friend of mine through her work in UK hospitals*. But really, these hand-finished caps, hats and scarves speak for themselves. Especially designed with 'us' in mind, there's a distinct 1920s/30s vibe to these pieces, and the materials are beautifully soft and comfy. Best of all, from my own standpoint, they provide the kind of head coverage we need: no more tugging your cap down to give the nape of your neck some warmth. There's a large range of designs that definitely suit different ages, but for me, the winning style is this 20s-esque cap in three different shades. It's a veritable compliment-magnet! 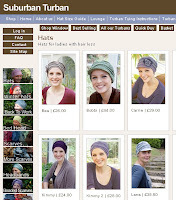 A short word on sizing: you'll find a handy how-to on the Suburban Turban site on the importance of hat sizing, which is a key lesson regardless of where you buy your headwear. So often I've tried on a 'non-specialised' hat in a shop only to find what looked fab on the plastic head looks ridiculous on mine. It took a while to realise that it's not always a matter of a bad hat (or bad head, for that matter), but merely a too-small or too-big one. So ladies: get measuring and refuse to settle for a wrong-sized hat. Hi Caro - really glad you've found the blog! I was in exactly your situation not too long ago, and I wish I'd known this stuff then, so consider yourself 'well armed' :) I'm afraid I'm not aware of any German online shop, however, why don't you give Nicky at Suburban Turban an email and explain your situation and what you're looking for? (nicky at suburbanturban.co.uk) She is a lovely person, and even if she can't solve your shipping issues she may know of a shop over there that she can recommend. It's certainly worth a try. I love your how to videos and can't thank you enough for them! I'm curious to know where you get your little black caps that you wear under scarves, buffs, etc? Thanks so much, Carly! 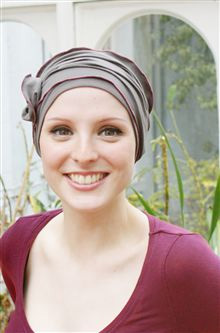 I'm thrilled - I just received my order from suburban turban and Kimmy was one of the ones I ordered. What a perfect co-incidence. Thanks again for taking the time to share your knowledge. I just started chemo and feel better having some tools in my arsenal to help me when I start to lose my hair. You are a wonderful inspiration to me. I have been diagnosed with SLE Lupus and am suffering with the effects of alopecia. I was on You Tube searching for ways to tie scarves and came across your videos. You truly made me smile with you positive attitude and wonderful tips. I really need that today. Then this website for hats and scarves to boot...Guess it was just meant to be...Thank you so very much! You truly were a God send today. Hi Kimberly, you are SO welcome and I'm thrilled to be of help. If you have any specific questions about scarf tying etc that you'd prefer to ask privately, you can message me via my YouTube channel (http://www.youtube.com/user/eyelineherblog) - I'm always happy to help. Hi Marcy, so glad you're finding the blog helpful! Really hope these tips are helpful as you embark on your chemo. Re: the Rimmel eyeliner, I am actually trying to find a US equivalent myself right now since no stores out here seem to stock it (I actually get my mother to send me it from the UK--thanks Mum!). BUT it seems you can order it online from ASOS, hurrah! Click hereto check it out. Also, re: wigs--I wore one for about three months when I first lost my hair aged 19 and it was totally wonderful for getting me through that transitional phase. I got it cut at a hair salon to take the extra volume off; a crucial thing to do, trust me. After that time, I realized that as helpful as it had been, I felt more like 'me' wearing scarves and hats, so my wig lives in the closet for now. It's a totally personal choice, and only you can make that decision. Whatever you choose, I wish you the very best! My mom has recently started chemo so we're new to scarves and hats but I love the Suburban Turban hat. We live in the states - do you know if we can get them here? They are really cute and look super easy to use/wear. Thanks Carly! I may have missed it, but I would really like to know where you got your little black cap that you wear under every scarf, buff, etc. Hello! I'm so glad I found this blog because I was thinking of ditching the wig and I was searching for tips, this has saved me, many thanks! !